When SQ 788 passed on the ballot this last June, it was a huge milestone for stoners, freaks, hippies, lawyers who like to let loose, and grandmas with glaucoma alike. 56% of Oklahomans voted ‘yes,’ and if my personal bubble of acquaintances is representative of that majority, they’re all in the mindset that weed is legal and we’ll be spending most our lives living in a cannabis paradise. This is a reminder that the state’s law enforcement is still going to be clamping down on people who are getting high without a permit, and the local media will report it like it’s the crime of the century. SPERRY, Okla. (KTUL) — Sperry police arrested a man and woman on Saturday for illegally growing medical marijuana in Sperry. Officers say they responded to a call of a dog bite around 8:50 p.m. and they knew where the dog lived, so they took it home. When police got to the home, 27-year-old Shane Remington answered the door and said he owned the dog. First of all, I had to look up where Sperry was for this story. It’s a suburb of Tulsa, and it must be so small that Officer Fife knows where everyone’s dog lives in the town. The officer said based on his training, he was able to smell a strong odor of marijuana coming from inside the house. Remington told police he had just smoked, but the officer said it was stronger than that. SPD placed Remington into handcuffs and went inside. The officer found 60-year-old Tami Remington and put her into handcuffs as well until he could obtain a search warrant. The officer went inside, arrested a 60 year-old woman, and THEN got a search warrant? I’m obviously not one of those lawyers who let loose-types, but that doesn’t strike me as legal. Officers received a search warrant soon after their arrival and found seven mature marijuana plants and eight younglings inside two separate indoor greenhouses with ventilation systems. They also found several empty baggies, scales, methamphetamine, cocaine and several other paraphernalia items. 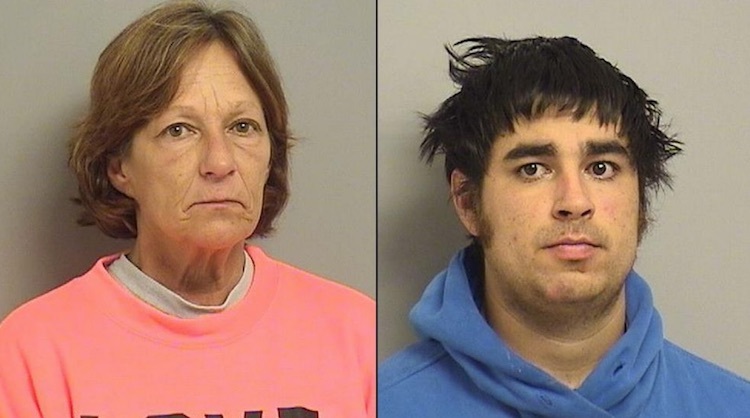 Tami and Shane Remington were booked into the Tulsa County Jail and are both facing multiple charges including possession of a firearm first offense, possession of marijuana with intent to distribute within 1,000 feet of a school or park, cultivation of marijuana and possession of drug paraphernalia. Ah, so they also had meth and coke, but the news story focuses on the pot plants? Even when listing the charges that this mom & son (I think? I hope?) are facing, KTUL left out whether or not the duo were being charged with possession of Schedule II drugs, and instead focused on the marijuana. While those drugs are obviously much nastier than harmless ol’ weed, I’m a firm believer that all drugs should be decriminalized. And on top of that, just smelling marijuana, which is now officially and legally accepted as ‘medicine’ in Oklahoma, should not give police the right to search your home and arrest your dear old mother. Obviously, the next step is for Oklahomans to push for recreational use, which is what we all wanted in the first place but were too scared to ask for. MJ has proven medicinal uses, but most of us just wanna get high, which is fine. It would be ridiculous to ask your doctor for permission to brew beer in your garage, but don’t even think about growing marijuana in the same garage until you’ve gotten the OK from your general practitioner. Given the existence of something called the Fourth Amendment, the tactics of the Sperry police are certainly questionable in this case. But these fine citizens of Sperry didn’t do themselves any favors by having meth and cocaine around in addition to their medicinal plants. Paraphernalia? I defy you to find me any household in Oklahoma that doesn’t have “empty baggies” in a a kitchen drawer somewhere. Calling Sperry (population 807 in 2010) a “suburb of Tulsa” is a huge stretch. It’s a poor and pathetic little settlement located in a swampy spot somewhere well north of the small burg of Turley and even further north of Tulsa, with lots of nothing in between. And as small as Sperry is, there may not be anyplace there that isn’t within 1,000 feet of a school or park. Hey,at least they were’nt caught dancing barefoot. Of course not, its Sperry, they all have top-siders and Univac computers. 95% of meth addicts also smoke marijuana. In stupid backwards logic marijuana is a gateway drug to methamphetamine. 99% percent of people I know who enjoy marijuana don’t use meth. 50% of my pot smoking friends don’t drink alcohol. Your saying apple’s are oranges, yet it’s all fruit? It’s gonna take Ok years to accept the weed thing .One because the leaderership are ignorant. Two because they have no other means of obtaining their own stash if not by throwing someone else under the bus. Old habits are hard to break. Habits Like having affairs while on the clock or meeting boys at hotels.